Steven A. Camarota is the director of research at the Center. The low overall unemployment rate (3.7 percent) for natives in the fourth quarter obscures the low labor force participation rate, especially for those without a bachelor's degree. There has been a long-term downward trend in the labor force participation rate of working-age (18 to 64) natives without a bachelor's degree. Only 70.7 percent of these natives were in the labor force — working or looking for work — in the fourth quarter of 2018; in 2007, before the recession, it was 74.3 percent; and in the fourth quarter of 2000 it was 76.4 percent. The labor force participation rate of working-age natives without a college degree has shown little meaningful improvement in the last six years. There was no improvement between 2017 and 2018 and the rate in 2012 was actually slightly higher than it was in 2018. The decline in labor force participation among those without a bachelor's degree is even more profound relative to those with a bachelor's or more. In the fourth quarter of 2018, 70.7 percent of natives without a bachelor's degree were in the labor force, compared to 86.6 percent of those with a bachelor's degree — a 15.8 percentage-point difference. In the fourth quarter of 2007, the gap was 12.3 percentage points, and in the fourth quarter of 2000 the gap was 10.9 percentage points. Working-age immigrants without a college education also have struggled since the recession. However, unlike natives, immigrants without a college education did improve their situation between 2000 and 2007. Also unlike natives, the labor force participation of immigrants improved in the last year, but still has not returned to 2007 levels. 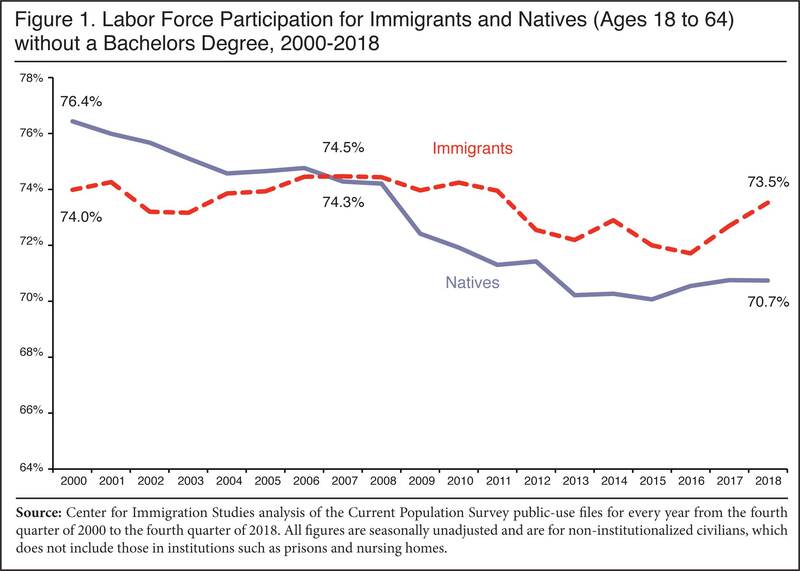 In the fourth quarter of 2018, the labor force participation rate of immigrants (18 to 64) without a bachelor's degree was 73.5 percent, somewhat better than that of natives, but still below their rate of 74.5 percent in the fourth quarter of 2007. In the fourth quarter of 2018, there were a total 47.5 million immigrants and natives ages 18 to 64 not in the labor force (all education levels), up from 42.1 million in 2007 and 36.6 million in 2000. Of the 47.5 million currently not in the labor force, 37.7 million (79.4 percent) did not have a bachelor's degree. Because it asks workers about their employment situation, only the CPS provides information about who is working, who is looking for work, and who is neither working nor looking for work. Moreover, only the CPS asks respondents about their socio-demographic characteristics, such as education, age, and country of birth. Thus, only the CPS can be used to compare employment among immigrants and the native-born. (The establishment survey is not released to the public, so no independent analysis of it is possible.) For these reasons, this analysis uses the public-use files of the CPS to examine employment in the United States by quarter. For each quarter, the three CPS surveys combined include roughly 325,000 natives and 42,000 immigrants. Like all government surveys, the data is weighted to reflect the actual size and demographic makeup of the U.S. population. The data for the tables and figures in this report comes from the public-use files of the October, November, and December CPSs for 2000 to 2018. The data presented here is reported by quarter. Quarterly data is more statistically robust than monthly data, especially for smaller populations like immigrants and minorities. Persons in institutions like prisons or nursing homes are not included in the CPS. The CPS is the nation's primary source for unemployment and other labor force statistics. The government publishes employment statistics that are both seasonally adjusted and unadjusted from the survey. The figures in this analysis are seasonally unadjusted. Unadjusted figures are computationally simpler and easier for other researchers to replicate. All figures for the total U.S. population in this report match seasonally unadjusted figures from the BLS. Since we compare the fourth quarter of each year, seasonality is largely removed from comparison over time. In general, the BLS does not provide separate estimates for the foreign-born (immigrants) and the U.S.-born broken down by characteristics like education, race, and age. However, all CPS respondents are asked these questions. The Census Bureau defines the foreign-born as persons who are not U.S. citizens at birth, which includes naturalized citizens, legal immigrants who are not citizens (green card holders), temporary visitors and workers, and illegal immigrants. The Unemployed. The standard measure of unemployment, referred to as U-3, takes the number of people who report that they are not working and have looked for a job in the last four weeks and divides it by the number actually working plus those looking for work. The top halves of Tables 1, 3, and 5 report the number employed and the number unemployed for the fourth quarter of each year, 2000 to 2018. The left sides of Tables 7, 8, and 9 also report the U-3 unemployment rate in detail for different segments of the population in 2000, 2007, and 2018. We focus on 2007 and 2000 because they represent the peak years of the last two economic expansions. The Labor Force. The labor force includes all those working or who have looked for work in the four weeks prior to the CPS. The bottom left of Table 1 shows the number and share of those 16 to 64 not in the labor force. When looking at the number and share not in the labor force, it is very common to report statistics only for those age 64 and under because the overwhelming majority of those over 64 do not work for reasons not related to economic conditions. 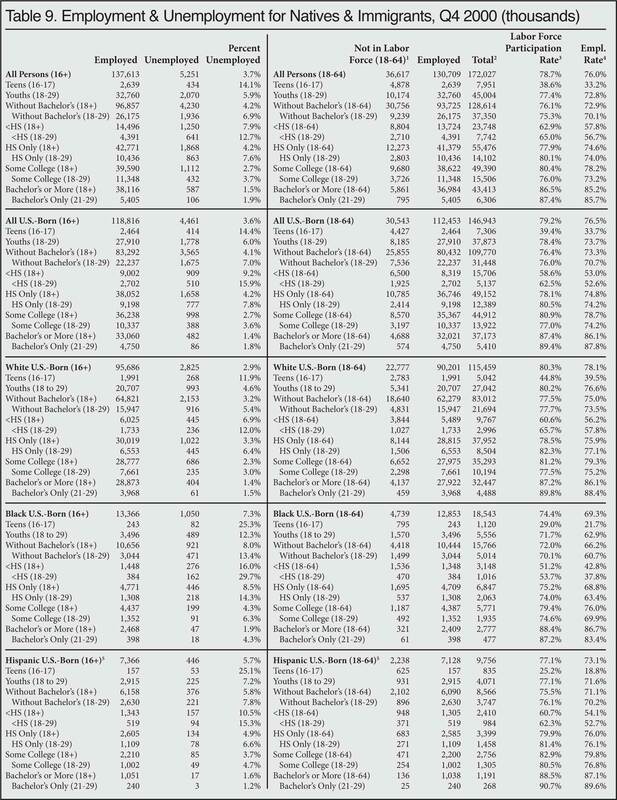 The right sides of Tables 7, 8, and 9 report the number working in detail for different segments of the population in the fourth quarters of 2000, 2007, and 2018. The tables also report the share of people in the labor force, which is the inverse of those not in the labor force, as shown in Tables 1, 3, and 5. 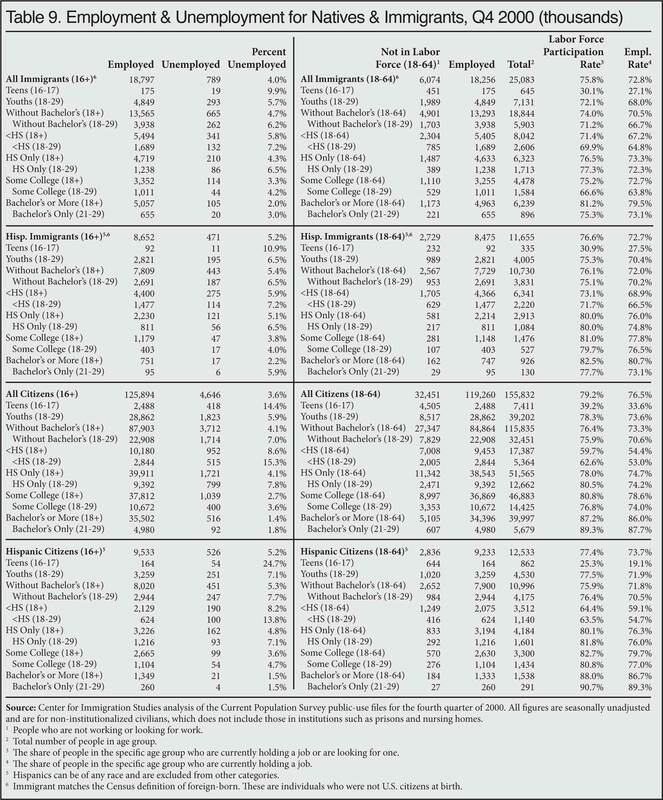 The right sides of Tables 7, 8, and 9 also report the employment rate. The employment rate is simply the share of people in each segment of the population who are working. 1 It is worth pointing out that rates in some states had already begun to fall by the fourth quarter of 2007 as the recession began at the end of 2007, so the decline is somewhat understated by comparing the fourth quarter of 2007 to the fourth quarter of 2018. 2 Young natives (18 to 24) have tended to fare the worst. 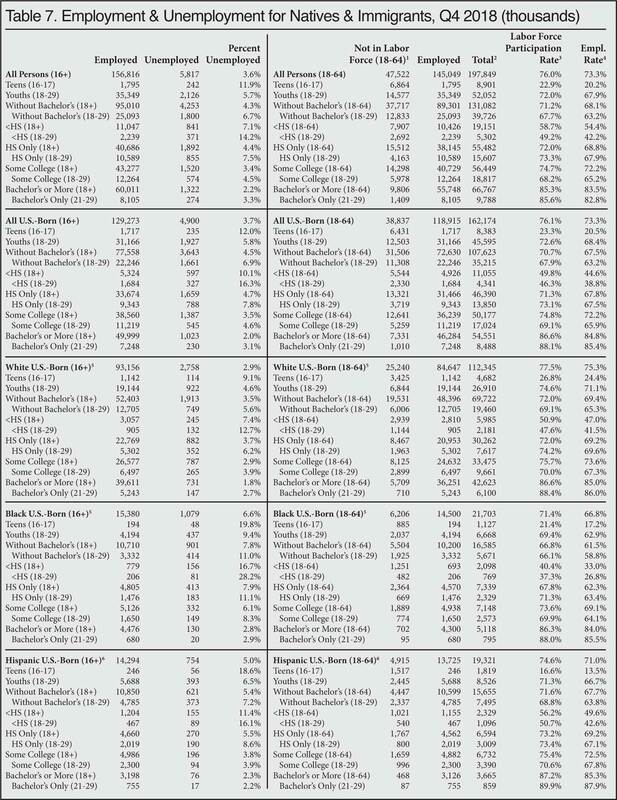 But even if we exclude them and look at those without a bachelor's degree ages 25 to 64, there were still just four states where the rate was higher in the fourth quarter of 2018 than in the same quarter of 2007, and just two states where the rate was higher in 2018 than in 2000. One of those states is West Virginia, which had by far the lowest native labor force participation rate in the country in 2000 and where the rate was only 0.3 percent higher in 2018 than 2000. 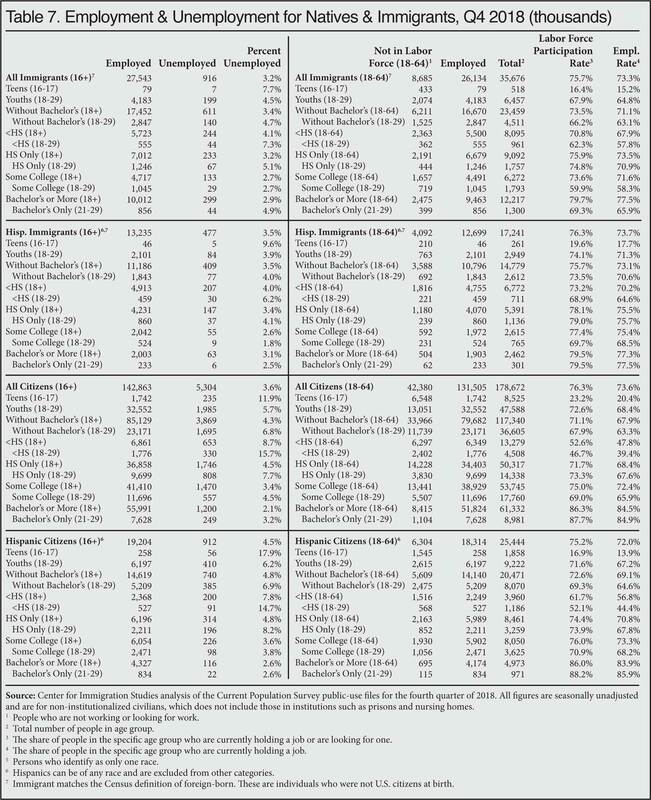 Table 13 has state data for those 25 to 64 without a bachelor's, and Figure 11 compares those 25 to 64 with a bachelor's and those without a bachelor's nationally. Figure 12 has figures for natives 18 to 24 without a bachelor's. 3 Unemployment figures are for all persons 16 and older.